I got the first sleeve sewn in. It look insanely skinny along most of the length of the arm, but it’s only because of the way the double rib looks. 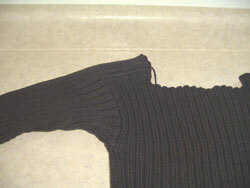 The whole time I’ve been making this sweater I’ve been panicing thinking it looks too small. Granted it is a snug fit and the next time I create this sweater I think I’ll be adding a few inches in the width here and there. 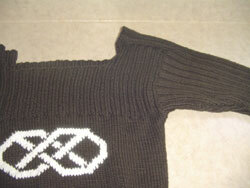 I hope to get the second sleeve on and then knit up the neck. I still haven’t decided if it’ll be a turtleneck or a crew neck.� I guess it’ll depend on whether I feel like doing a bunch more ribbing.